It’s that time! I can finally dig into my French terry and sweater knit stash. I’ve been staring at this fabric sitting on my shelves for what seems like ages. I have A LOT of French terry because it’s another one of those fabrics that I can’t pass up on when I find the good stuff. Also solids are great to mix with prints leftover from other projects. You might recognize this boucle double knit from my coatigan. I just couldn’t toss any of these leftovers, although to be honest I have enough leftovers to make another top. Anyway, this black bamboo/organic cotton French terry fabric is incredibly soft, has 4 way stretch and excellent recovery (thanks to the 12% spandex). You know I grabbed it from Cali Fabrics too! Plus I had the Aspen Pullover from Peekaboo Patterns in my stash since last year, so I figured it was time to get to it. 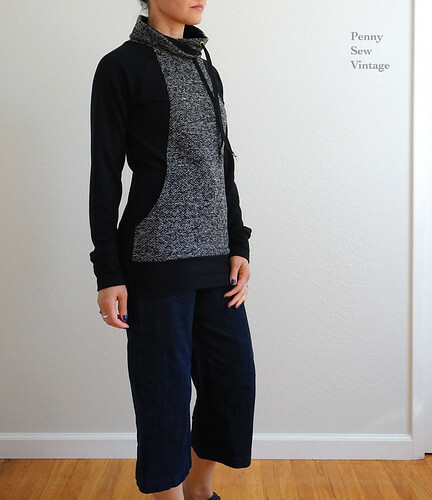 It has a pretty wide size range, raglan sleeves, secret pockets, includes a nursing option, and has a cowl or neckband finish. I made a size XS since all of my measurements fell in that size range (which NEVER happens) with the cowl neckline option. The first picture at the top shows the cowl pulled a bit closer, but here’s the cowl pulled open more. I used gold colored grommets for the ties I think I picked up at Wawak, and heavier black twill tape from JoAnn’s. I had just cut the twill tape to size when I took these pics, so the ties’ ends aren’t finished yet. I was taking pics for another top I made so I figured I’d throw this on too and grab some pics while I could. This pullover can also be pulled down like a tunic. I think this would look really nice with leggings, but y’all are never going to see me in leggings, lol! It would probably look good with cigarette pants too, so I’ll need to make some of those (if I can get the fit down that is). Here it is pulled down from the back. 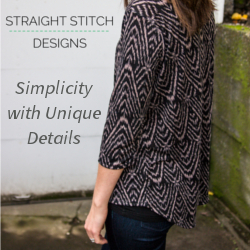 This French terry is amazing because it has excellent stretch and recovery making it perfect as a tunic length pullover. I love this sweatshirt though, and I’m so happy with the way it turned out. It’s cozy, was quick to make (I used larger stretch needles in my serger because it’s super stretchy) even with the pockets (they’re super easy!!! ), and I see more coming my way. There’s also a pattern add on with hoodie options if that’s what you’re looking for, so you’d get lots of value with this pattern. I’m wearing this with my McCall’s pants. After washing and wearing several times, they fit even better. I’m loving them and am planning another denim pair, probably with a patterned denim though. Who knows when I’ll get to that, but hey I’m in no rush, clearly. I’ve definitely taken this slow fashion movement seriously! I have several cold weather projects to get to, but I’m wondering, what do you have planned? I love inspiration!